Color(s): Red, white, black and tan, black, brown; solid or blended. The Doodleman Pinscher is created by the crossing of two breeds: Doberman Pinscher and Standard Poodle. They are commonly referred to as "designer dogs" and are one of a larger size of crosses. The ideal Doodleman Pinscher possesses a well-proportioned and muscular appearance. They have distinctive facial features and normally have the long ears of the Poodle. The Doodleman Pinscher is hardy, bold, and agile. The Doodleman Pinscher will typically be pleasant, good-natured, and affectionate. They are loyal, devoted, and loving. They do best in a home with older, considerate children. They will generally do well with other dogs and non-canine pets. Doodleman Pinscher's are suspicious of strangers but should not be aggressive. They are protective of their family, property, and territory and make excellent watchdogs. Depending on coat type, the Doodleman Pinscher requires frequent brushing to remove loose and dead hair or professional clipping. It is important to keep the ears clean to prevent infection. They may be prone to such health issues as Von Willebrand's Disease, bloat, hip dysplasia, Wobbler Syndrome, PRA, skin problems, and epilepsy. 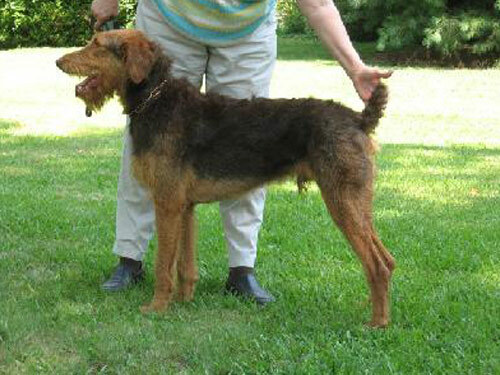 The coat of the Doodleman Pinscher is of medium length and may be curly, wavy, or straight. The Doodleman Pinscher may be stubborn and dominant. Early socialization and obedience are a must. They will not respond to harsh or heavy-handed methods. Training must be done with firmness, fairness, patience, and consistency. The Doodleman Pinscher will do okay in an apartment provided they are sufficiently exercised and mentally stimulated. They do best in a home with an average-sized securely fenced yard where there is ample room for off-lead play. The Doodleman Pinscher thrives on family interaction and securely leashed walks.